About "KJV Wide Margin Personal Notes Bible Brown Tan (Red Letter Edition)"
This beautifully produced Bible range presents the complete text of the KJV in double-column format, with 5cm-wide ruled margins on either side for notes and reflections. Also features: presentation page; words of Christ in red; section headings; 15 pages of helps, including short book summaries; gilt page edges; ribbon marker. 18.3 x 24 x 4.4cm. Your Bible study will never be the same. . .when you record your observations and insights on the actual pages of "The KJV Journaling Bible. "This beautiful Bible, featuring the complete text of the beloved King James Version, also includes super-wide margins for you to record your reactions to God's Word. At approximately 61/2" x 9," it's big enough to read and write in. . .but small enough to carry comfortably. 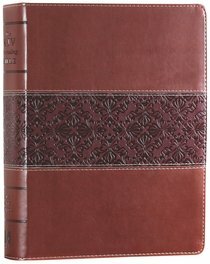 Available in both bonded leather and leather-like covers, "The KJV Journaling Bible" makes a desirable gift--for others or even yourself!